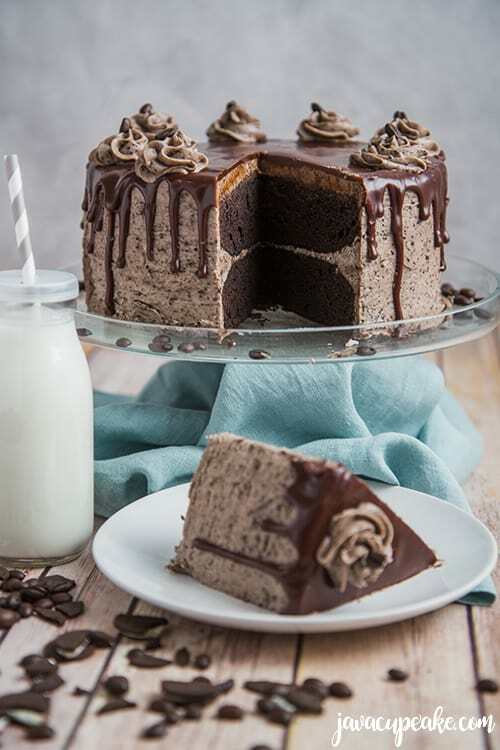 Rich layers of espresso filled chocolate cake topped with whipped cookies and cream buttercream, a drizzle of chocolate ganache and more buttercream make this Mocha Cookies and Cream Cake a decadent dessert sure to please the chocolate lovers in your life! Imagine a quiet afternoon with no kids, no distractions and and hour to yourself. 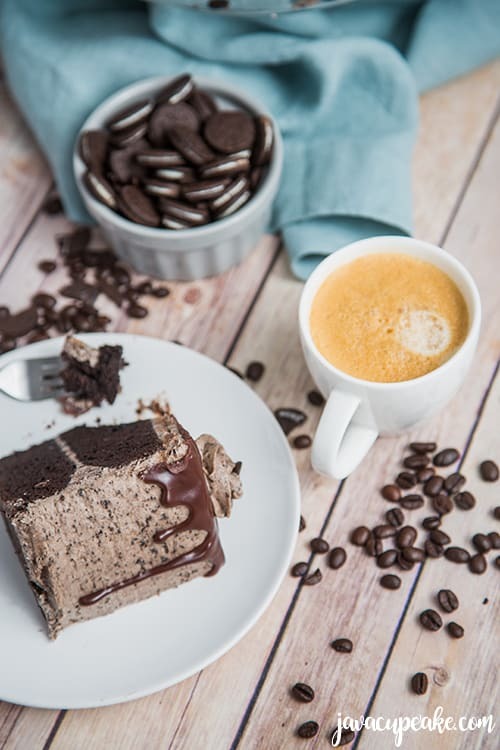 Now, imagine holding a big cup of steaming, hot coffee topped off with Coffee-mate® Cookies & Cream creamer while seated comfortably on the couch under a cozy blanket with a big slice of cake to indulge in. Let me tell you… it was. This was me about two weeks ago, right before my kids were home for 13 days (snow days and spring break) enjoying a few cherished moments of silence. Feeling inspired by my new favorite Coffee-mate Dessert Creamer in the Cookies & Cream flavor, I decided to recreate the magic of that afternoon in cake form. 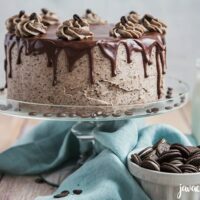 However in order to make this Mocha Cookies and Cream Cake I needed a recipe! I knew I’d start with my chocolate cake recipe, but I needed to kick it up a big notch by adding more espresso to the batter to really bring out the coffee flavor. Two tablespoons of espresso powder to be exact! 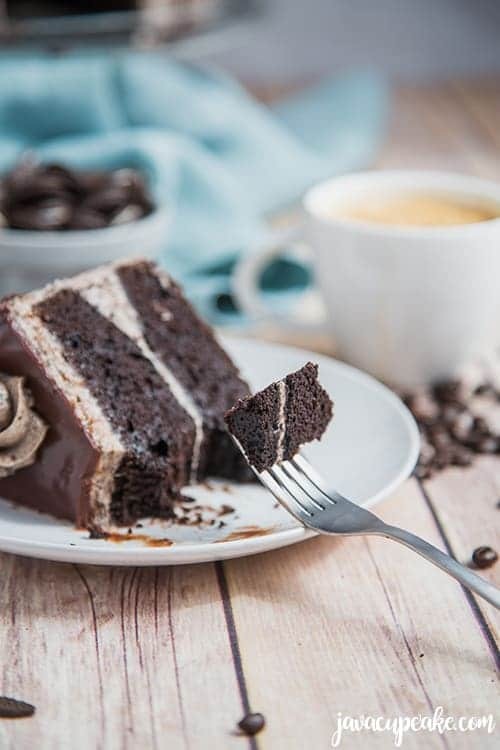 Two tablespoons of espresso in one cake means there will truly be a strong coffee flavor to the chocolate cake making it mocha-licious! The Coffee-mate® Cookies & Cream Creamer reminds me of what it tastes like when I eat a chocolate cream sandwich cookie and dunk it in milk. I like my cookie extra soaked in milk so it gets mushy and melts in my mouth and the Coffee-mate Cookies & Cream creamer tastes exactly like that… but with coffee! To replicate the cookies and cream flavor for the frosting in the Mocha Cookies and Cream Cake, I decided to start with a basic vanilla buttercream recipe. I would whip the vanilla buttercream until it was light and fluffy and then fold in 16 crushed chocolate cream sandwich cookies! 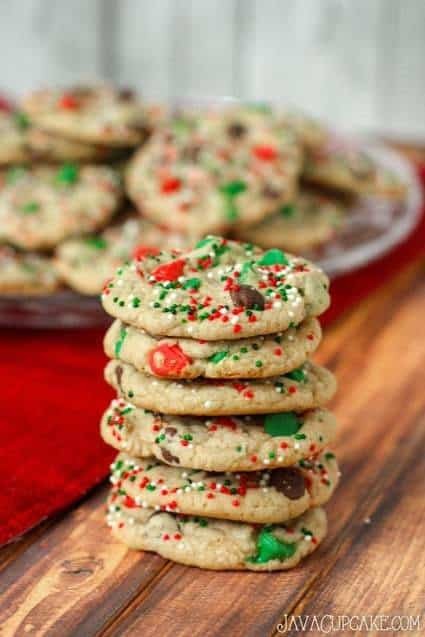 The cookies would need to be a little chunky so when I bite into the frosting, I get a piece of cookie in several bites. To add some pizzazz to the cake, I knew it needed to not only taste good, but it needed to look spectacular! Drip cake! Yes! 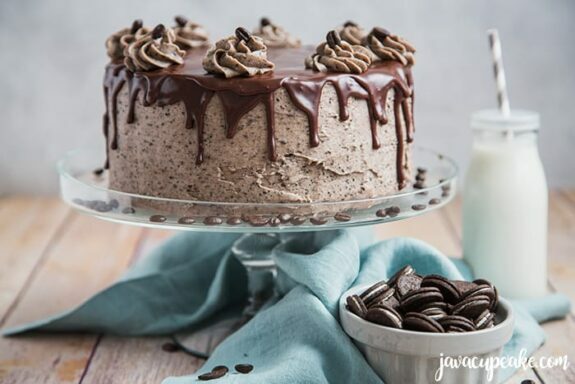 Chocolate ganache dripping down the sides of the cake would take this mocha cookies and cream cake over the top! 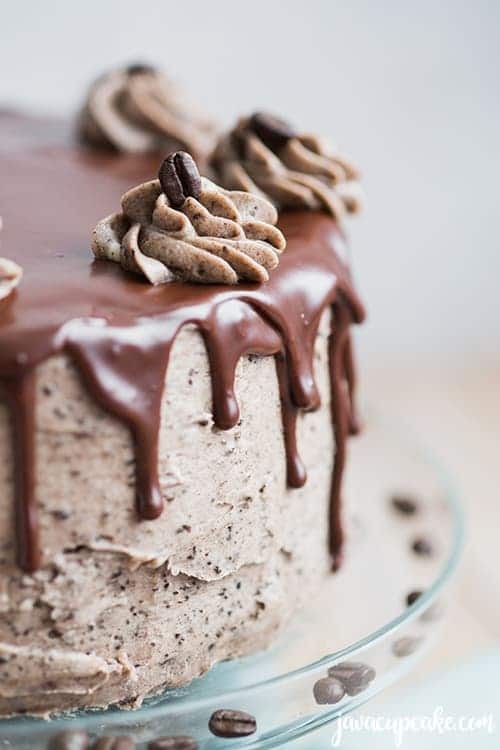 Swirls of cookies and cream buttercream and a few whole coffee beans on top make the cake perfects! 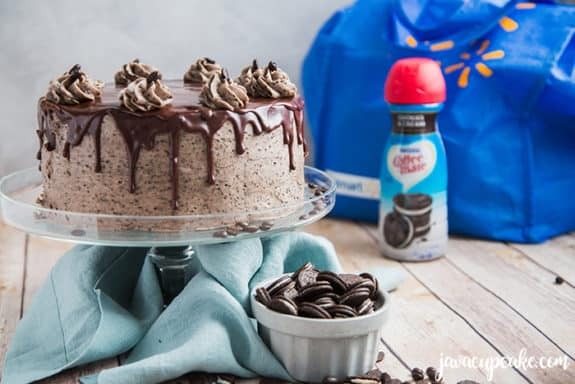 For supplies, I knew I only had one choice of stores to stock up on supplies for this sinfully delicious Mocha Cookies and Cream Cake… Walmart! What I love about Walmart is that the location in my neighborhood is so close to me making shopping incredibly convenient! Walmart is my go-to place for easy shopping trips, especially when I’m on a budget. 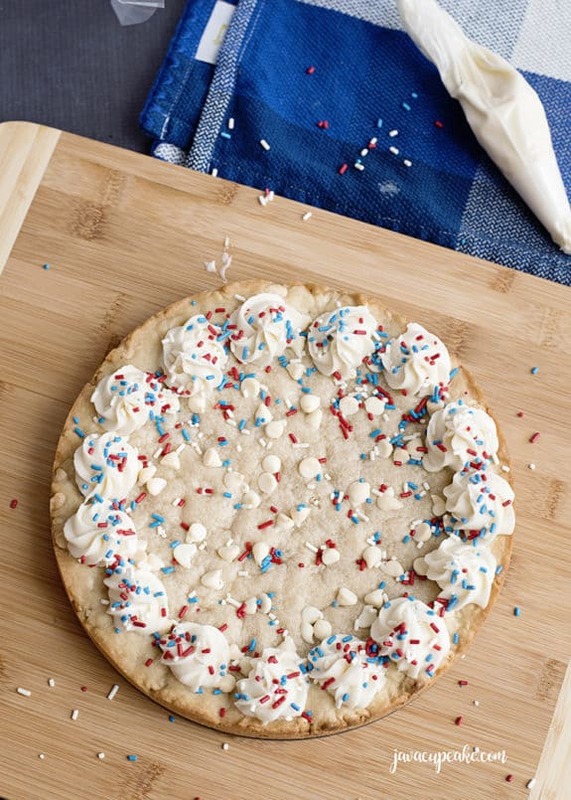 Did you know that you can get Coffee-mate Dessert Creamers in three different flavors at Walmart? They’re super easy to find at the store… located with the rest of the coffee creamers in the cold dairy section. These creamers are NEW and only available seasonally so if you want to try them, you have to act fast! You already know I’m sold on the Cookies & Cream flavor but there’s also Toasted Marshmallow Mocha and Coconut Caramel Latte that you won’t want to miss out on either. 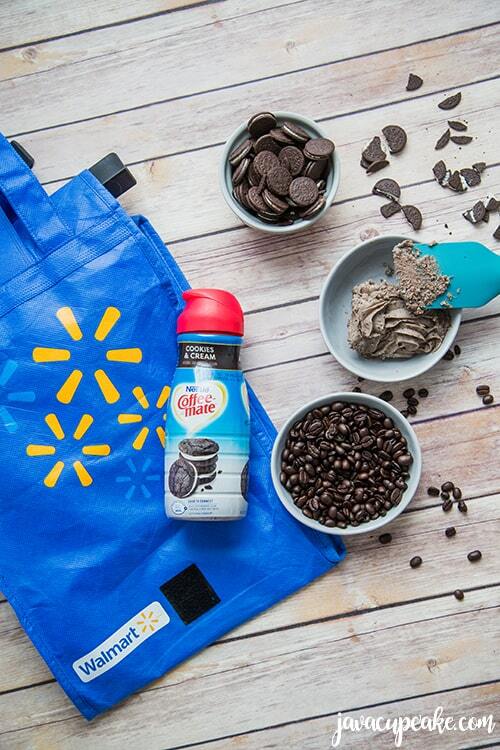 And on May 10-13th you might even be lucky enough to try Coffee-mate Dessert Creamers in your local Walmart store! 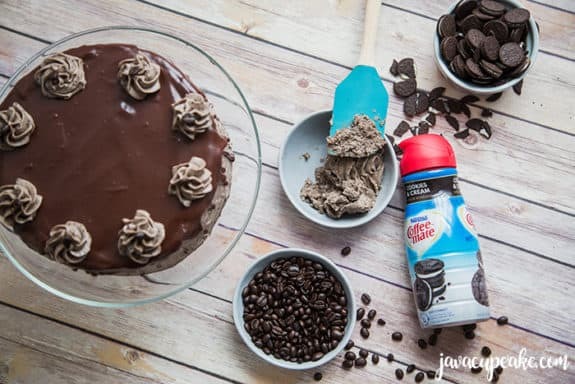 So, the next time you’re sitting down to enjoy a quiet afternoon with your cup of coffee, make sure you’re using Coffee-mate Dessert Creamers… you never know what kind of dessert you’ll be inspired to make next! 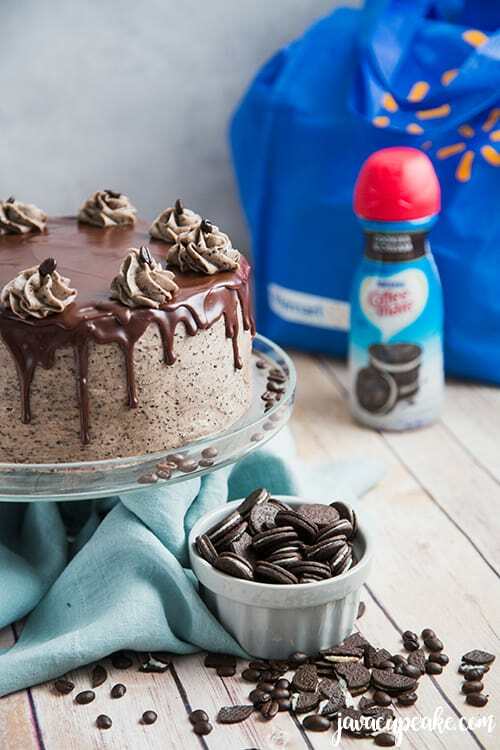 Check here for more inspiration and details on the new Coffee-mate Dessert Creamers at Walmart! I really hope you enjoy this Mocha Cookies and Cream Cake as much as I did, my photographer did and everyone we shared it with! Preheat oven to 350 F degrees. 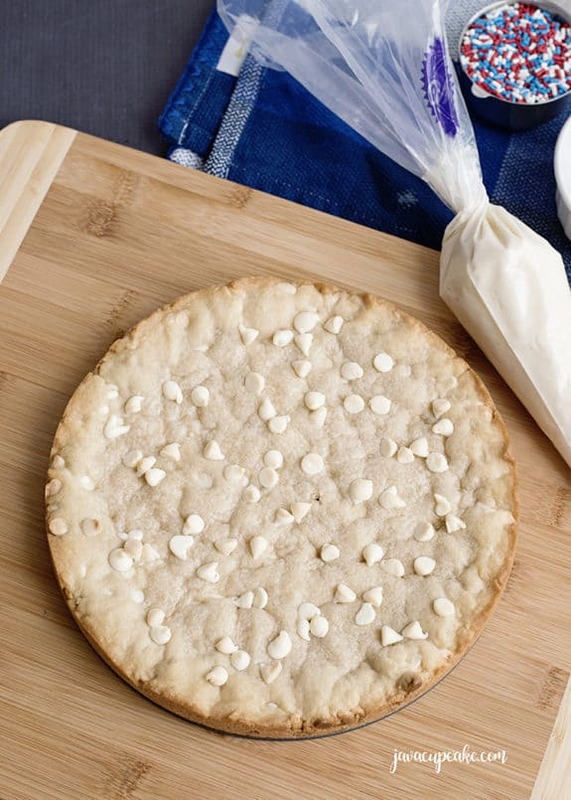 Grease, line with parchment paper and flour 2 9-inch cake pans. Divide the batter evenly into the 2 prepared pans. Each pan should get 3 cups of batter. Bake 26-28 minutes or until a toothpick comes out clean. Cool in pan for 10 minutes before removing from the pans to cool on a wire rack. Once the cakes have cooled, but are still warm, use a cake leveler to cut off the round mound on the top of the cake. Make sure both layers are the same height. In the bowl of your stand mixer, cream together the butter, sugar and half the cream until smooth. Mix in the vanilla and salt and mix to combine. Scrape the bowl. With the mixer on low, add the remaining cream. Whip on high speed for 3-4 minutes. Crush the sandwich cookies until coarse. Add to the buttercream and mix until just combined. In a small pan, heat heavy cream to a simmer. Do not boil. Pour the hot cream over the chocolate chips in a medium bowl. Let sit for 3 minutes without stirring. With a spatula, stir slowly until all the chocolate has melted. Place the first cooled cake layer on your cake stand/plate, cut side up. Spread a layer of frosting onto of that layer evenly. Place the second layer on top, cut side down. Fill in the sides where the layers come together so that the frosting in the center extends all the way to the edge. Spread a very thin coat of frosting over the entire cake. Chill for 20-30 minutes. Fill a 12in piping bag fitted with an open start tip with frosting. 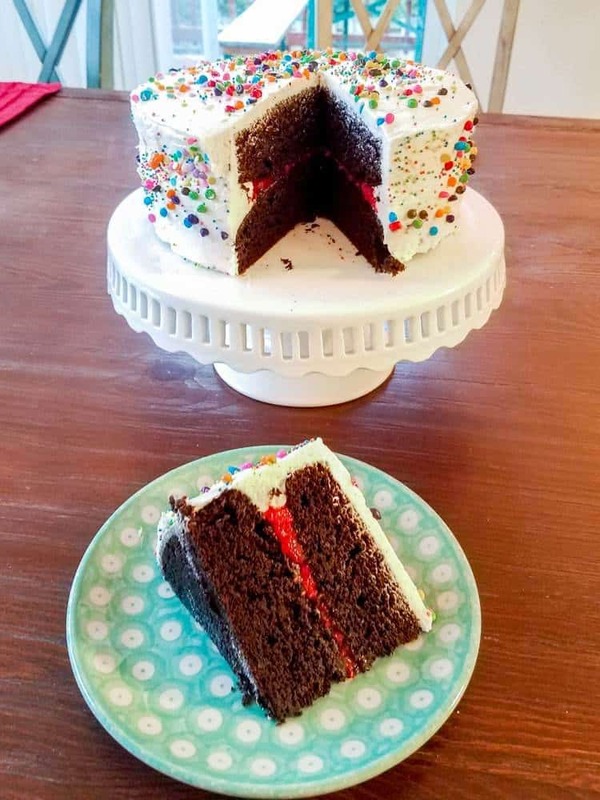 Use the remaining frosting to completely cover the cake. Use a straight edge to smooth out the top and edges of the cake. 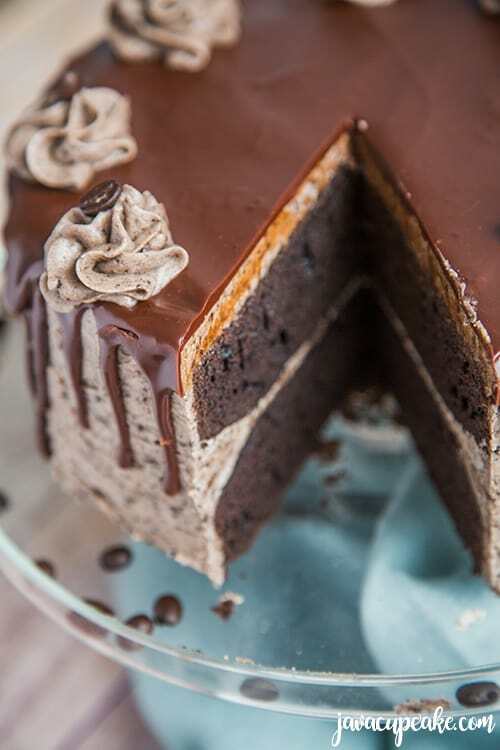 Using the squeeze bottle, start in the center of the top of the cake and squeeze the ganache in an circular pattern until it just reaches the edge of the cake. 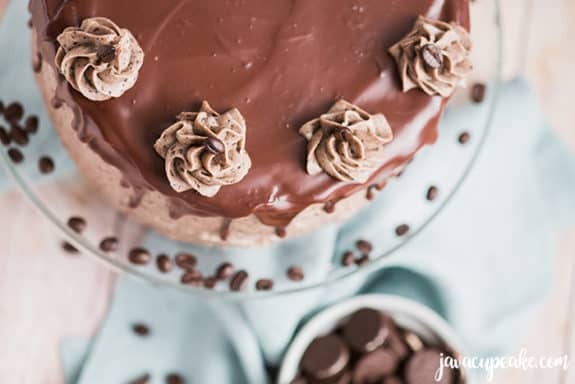 Use a flat edge (spatula or knife) to press the chocolate over the edges causing a drip. 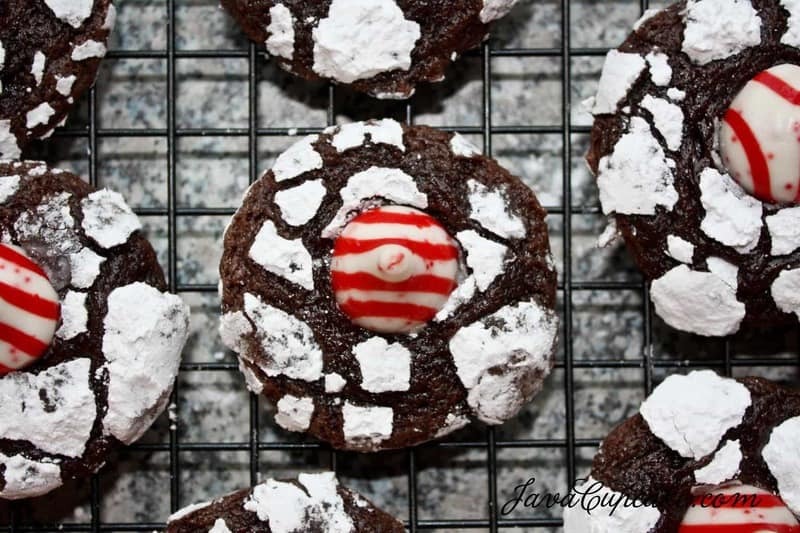 If necessary, squeeze more chocolate on the edges in places that need more dripped chocolate. Allow to set for 10 minutes to set. Pipe swirls of frosting on top of the cake equally around the edge of the cake. 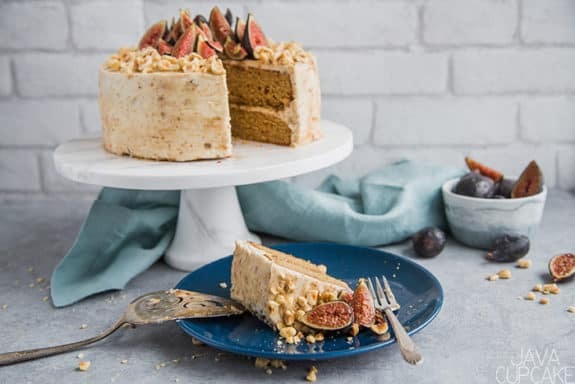 This sophisticated Hazelnut Fig Cake is gently spiced, full of flavors including dried figs, fresh figs and dark brown muscovado sugar, and is finished with a decadent fig cream cheese icing. You don’t want to miss out on this cake! It was last fall when I was first introduced to dried figs. I was enjoying an evening at my friend Fanette’s house and she had a charcuterie with delicious cheese, bread, nuts and dried figs. I knew I would enjoy the cheese and bread, but what in the world were these dried little fruits!? At first, I was scared to take a bite… but let me tell you as soon as I did… I WAS HOOKED. I loved these dried figs! A slice of cheese, chuck of bread and half a dried fig together and I was in heaven! 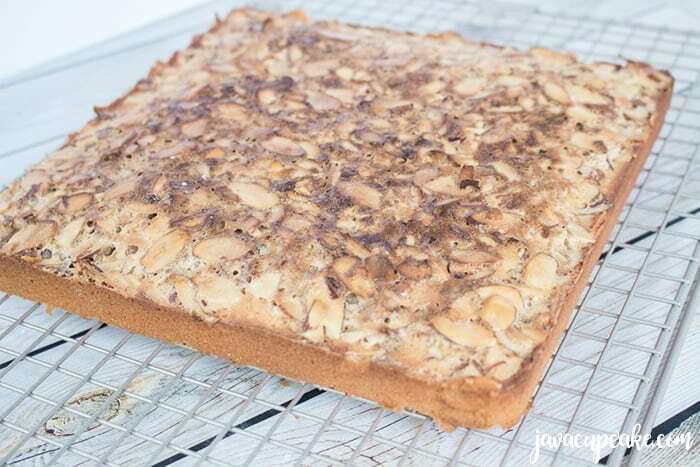 It was then that I decided that I MUST come up with a recipe that included figs and this Hazelnut Fig Cake was born! 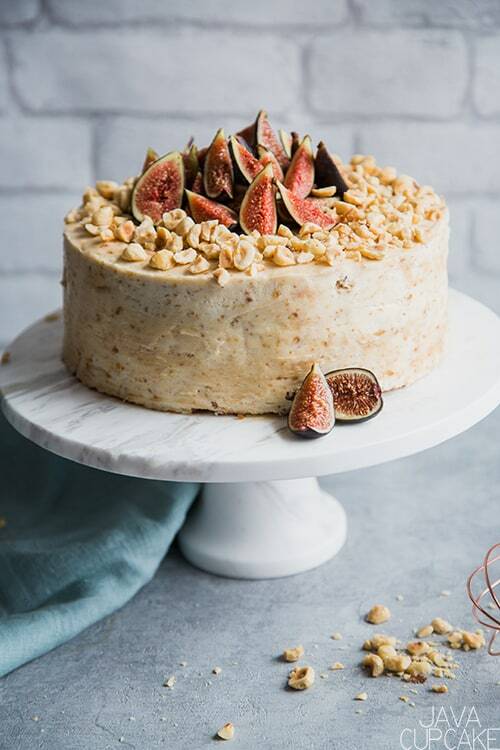 I did a bit of research to find a fig based cake on Google and Pinterest, but didn’t find many cakes that were the style I was looking for. Most had fresh figs in the cake similar to how you make a pineapple upside down cake and I wanted to make a layer cake. 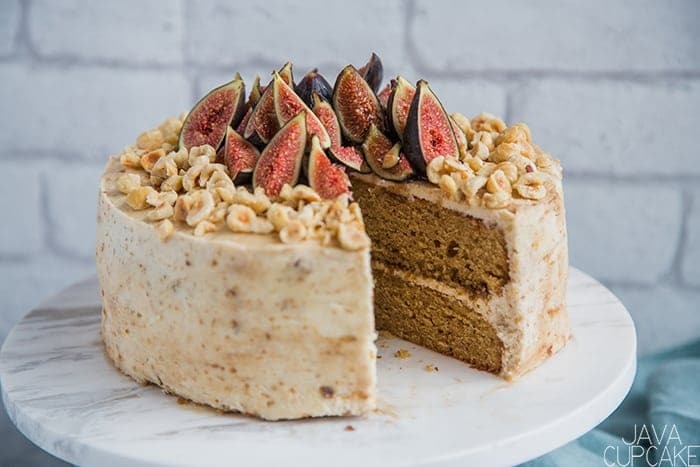 Finally, I found a recipe from BBC Good Food for a spiced fig, hazelnut and coffee cake that not only looked delicious, but the recipe looked amazing! 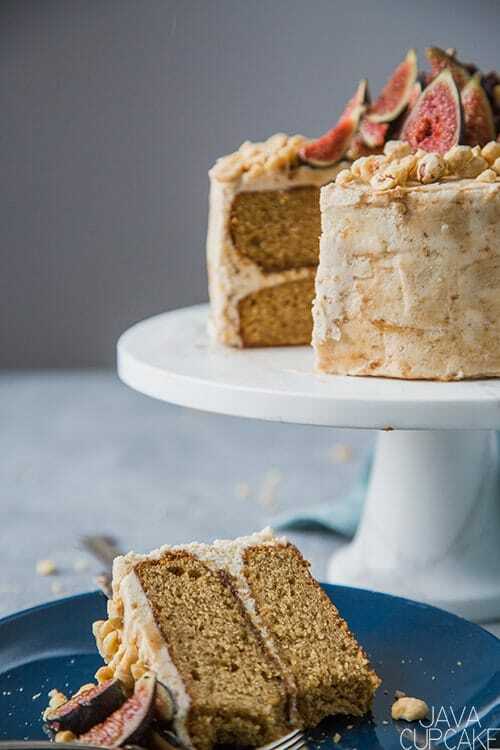 Let me tell you about my Hazelnut Fig Cake. 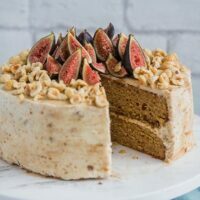 First, not only is my Hazelnut Fig Cake is packed full of figgy flavor, nutty undertones a touch of sweetness from the cream cheese fig frosting, it is flavored with coffee. Yes, you read that right… I said coffee! Coffee adds such a rich balance to the sweet fig and the roasted hazelnuts that’s undeniably delicious! 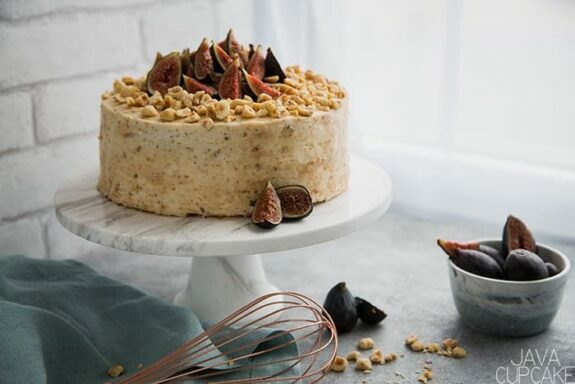 The fresh figs and roasted hazelnuts that top the cake add another dimension of flavor and texture that is sure to please your palate! 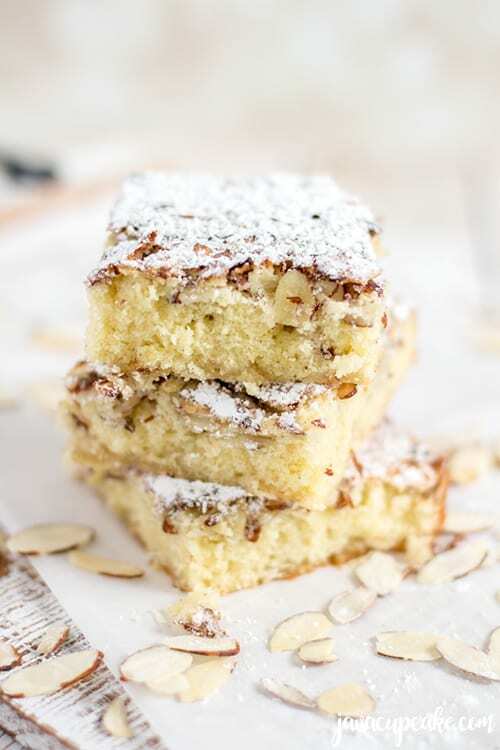 From the first bite of this Hazelnut Fig Cake, you will seriously feel like you have died and gone to Heaven. 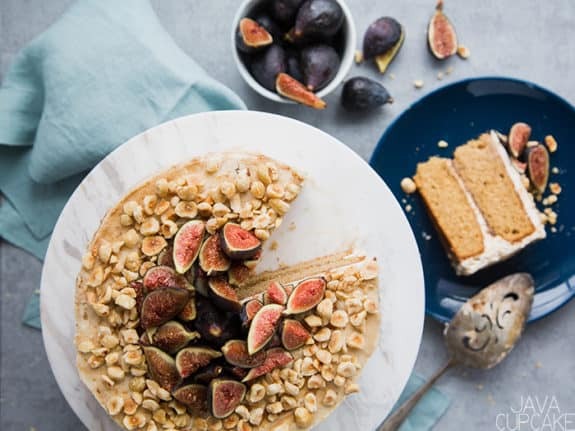 So if you love fig… you are going to LOVE this Hazelnut Fig Cake! Put the 6 dried figs and hot coffee in a cup together and let sit while preparing the batter. Grease and flour two 8in round cake pans. Once the oven has heated, place the hazelnuts on a baking sheet and roast for about 7-8 minutes or until they begin to turn golden brown. Remove from the oven and pulse 75g of the nuts in a food processor until finely chopped. Set aside the rest to garnish the cake with later. Add the 75ml of coffee and figs and whizz the food processor until combined. Add the butter, brown sugar, yogurt, eggs and vanilla bean paste and turn the food processor on for 10-15 seconds. Take the blade out, scrape the bowl down and whizz for 10 more seconds. 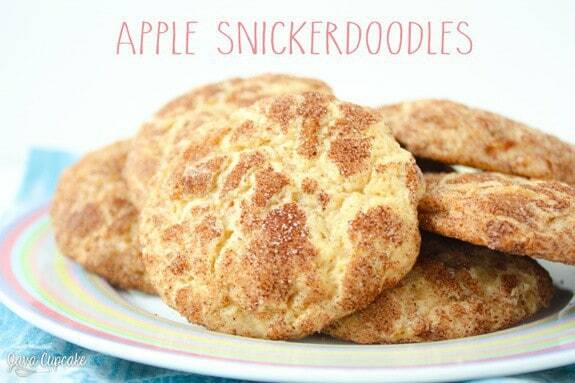 In a large bowl, sift together the flour, baking powder, cinnamon, nutmeg, cloves, and salt. Pour the wet ingredients into the large bowl. Fold together until combined. Pour half into each prepared baking pan. Bake for 24-26 minutes or until a toothpick comes out clean. Cool for at least 10 minutes before removing to a wire rack to cool completely. Chop the 15 dried figs and combine with the strong coffee. Let sit for 15-20 minutes. After the figs have soaked in the coffee, pulse them in a food processor with the coffee until it becomes a paste. Set aside 3 tablespoons of the mixture for the frosting. In the bowl of a stand mixer fitted with the paddle attachment, add the butter, vanilla extract and cream cheese and beat until smooth. Add half the sugar and mix until combined. Add the reserved 3 tablespoons of fig paste and mix until combined. Scrape the bowl down and mix again. You may not need all the sugar, so start slowly adding the remaining sugar. 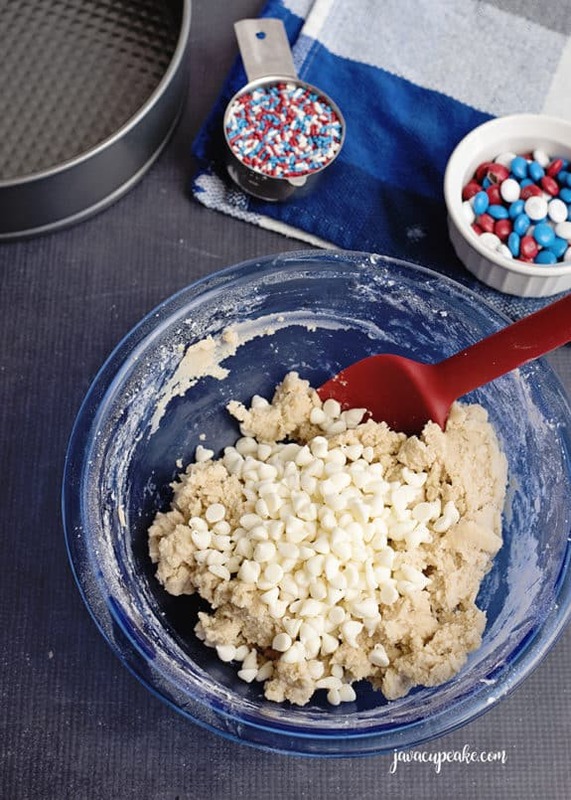 Add a few tablespoons at a time and mix gently until combined, checking the consistency of the frosting. More sugar makes cream cheese frosting softer, so be gently with adding it and beating. Place the first cake layer, top up, on the cake stand. 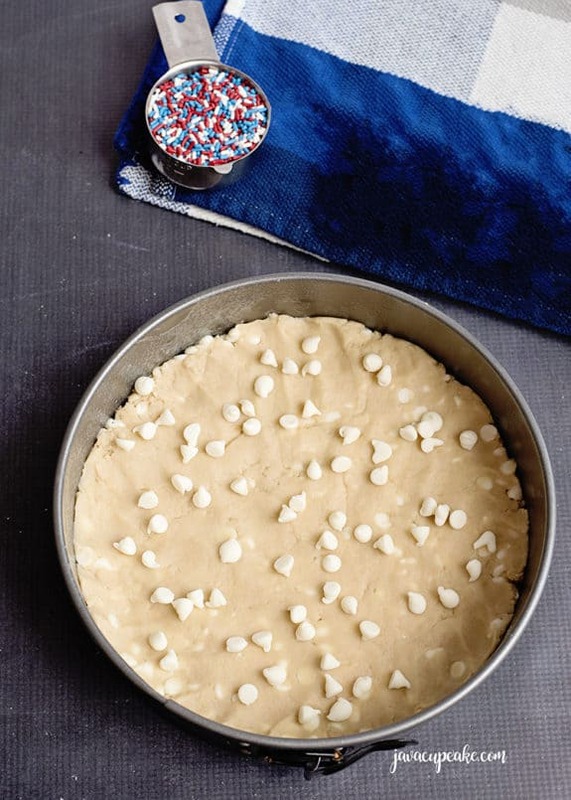 Spread a thin, even layer of frosting over the top to the edges. Spoon the fig mixture onto the frosting and spread out leaving about one inch of the edge with no fig. Place the second cake layer top down on top of the frosting. Press down gently. Place a thin layer of frosting around the outside of the cake. This is called the crumb coat. Chill the cake for 20-30 minutes allowing the crumb coat to firm. Use the remaining frosting and cover the entire cake with an even layer. Keep chilled until ready to serve. 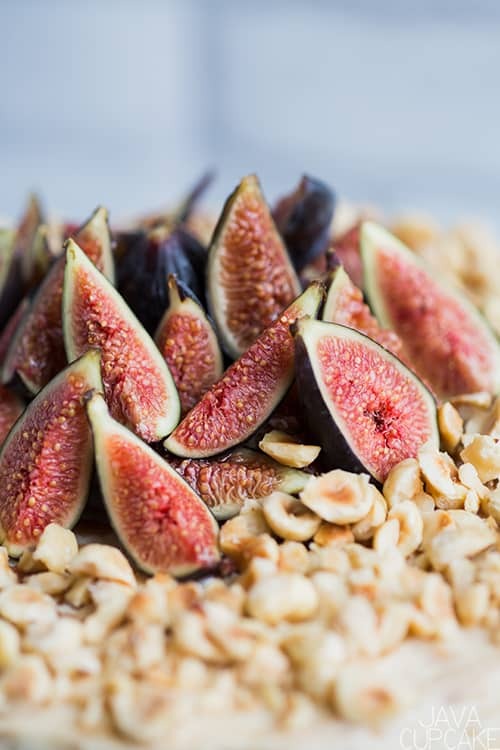 Once ready to serve, take the cake out for 10 minutes and prepare the fresh figs and remaining hazelnuts. 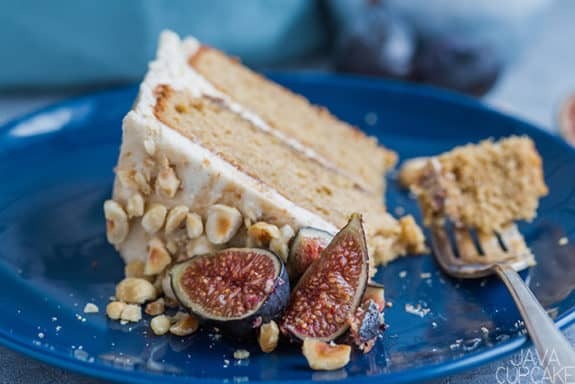 Slice the fresh figs and top the cake with them. Gently chop the remaining roasted hazelnuts and add them to the top of the cake. 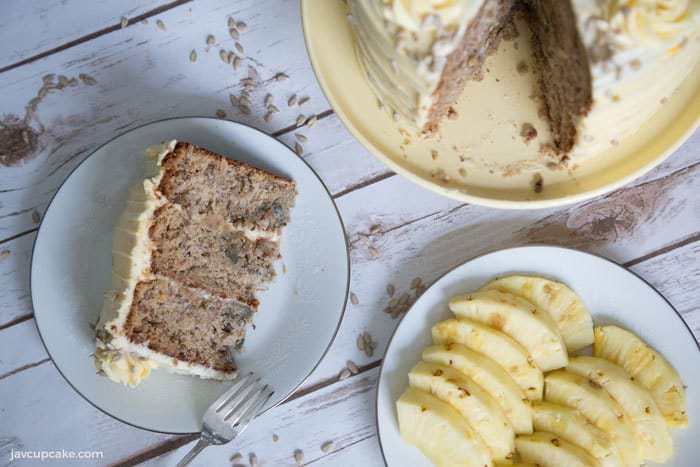 This nut-free recipe for Hummingbird Cake is full of pineapple, banana, and sunflower seeds! There’s so much flavor you won’t miss the nuts! I’m allergic to nuts. I mean, I can have peanuts because technically they’re a legume, but almonds, walnuts, cashews… they make me swell up and honestly I don’t want to know what happens after that. 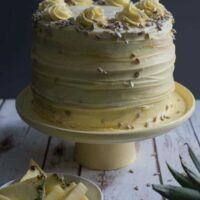 Since Hummingbird Cake traditionally has nuts in it, I’ve never tried it because of that. I was recently at an event where the Hummingbird Cake was made by Dog Tag Bakery. DTB is a nut-free bakery and when I realized that the cake would have no nuts I jumped at the chance to try it! 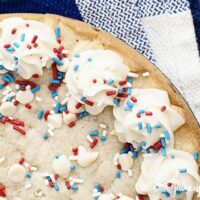 This recipe actually is the same recipe they use at Dog Tag Bakery! I’m so blessed to know the pastry chef there and she was so gracious to share it with me! Thank you, Rebecca! Holy cow… I’ve been missing out in my life!! 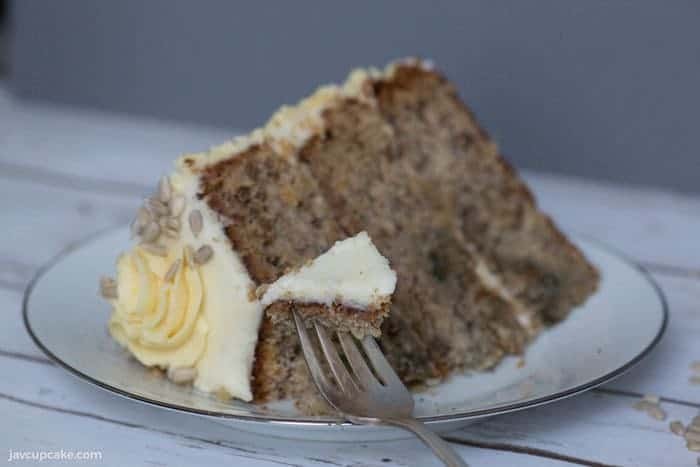 The combination of the banana and pineapple together make the Hummingbird cake incredibly moist and flavorful. 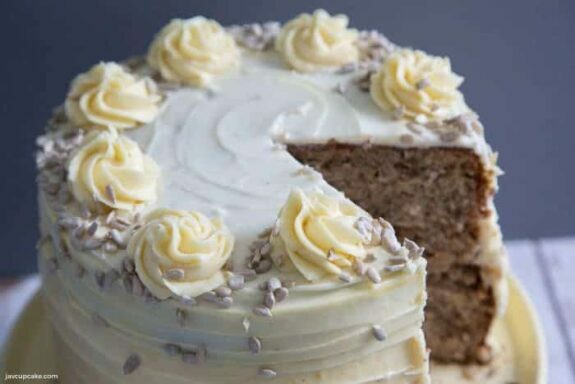 Add the crunch of sunflower seeds and the richness of the cream cheese frosting and OH MY this cake is out of this world! Making this cake was fun too. It was the first cake I assembled at my photographers studio so it was a challenge to decorate it without all my tools at home. 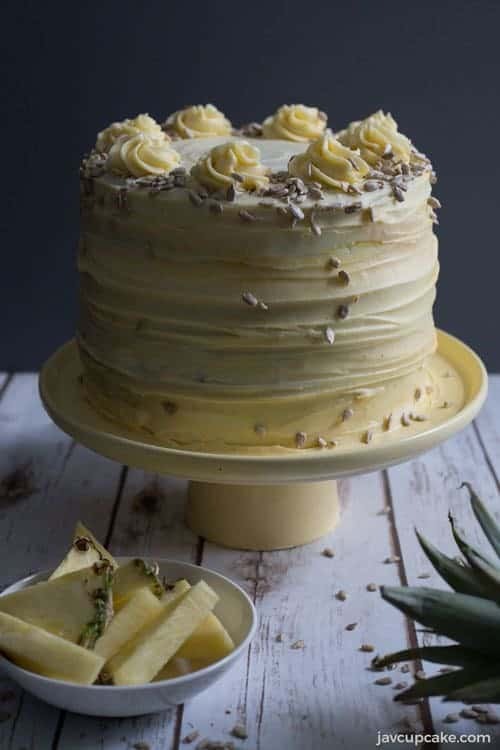 Fanette of Frenchly Photography did an amazing job capturing the beauty of this Hummingbird Cake! The recipe that Rebecca gave me didn’t include a recipe for frosting. So, I used my pipeable cream cheese frosting recipe and doubled it to have enough to finish off the cake. Preheat oven to 400F degrees. Line, grease and flour 3 8in round cake pans. 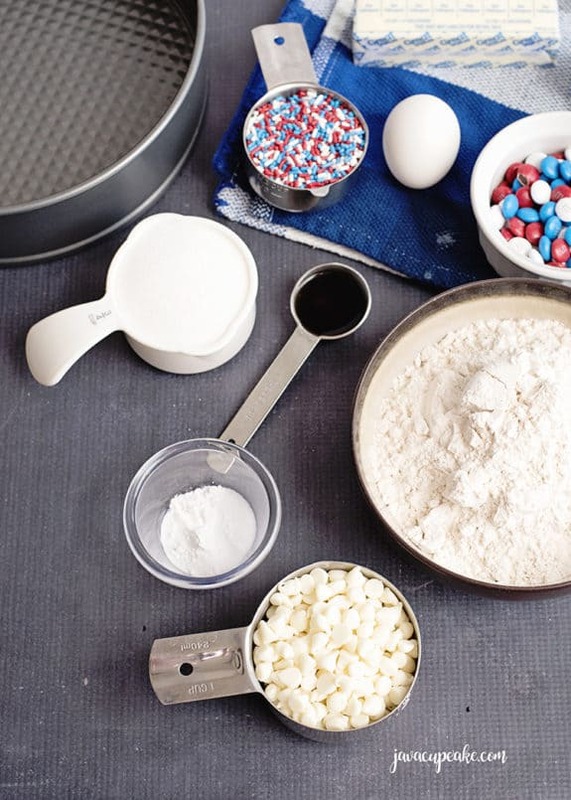 Weigh the flour, sugar, salt, baking soda and cinnamon and set aside. 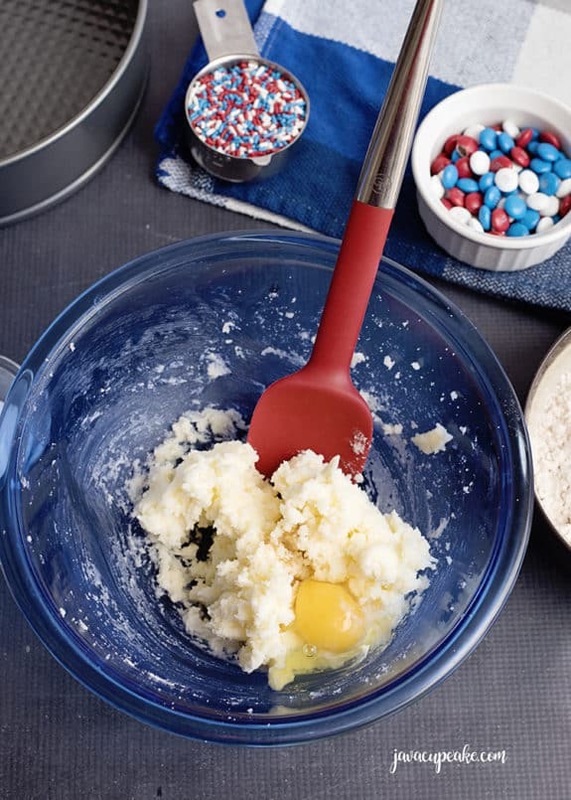 In the bowl of a stand mixer fitted with the paddle attachment, mix together the eggs and oil. Sift the dry mixture into the bowl with the eggs/oil. Mix on low for 1 minute, making sure the bottoms and sides of the bowl have been scraped so all the dry is combined into the wet. Do not over mix! Fold in the banana and pineapple. Mix on low for 30 seconds. Add the sunflower seeds and mix an additional 15 seconds. Scrape the bowl. 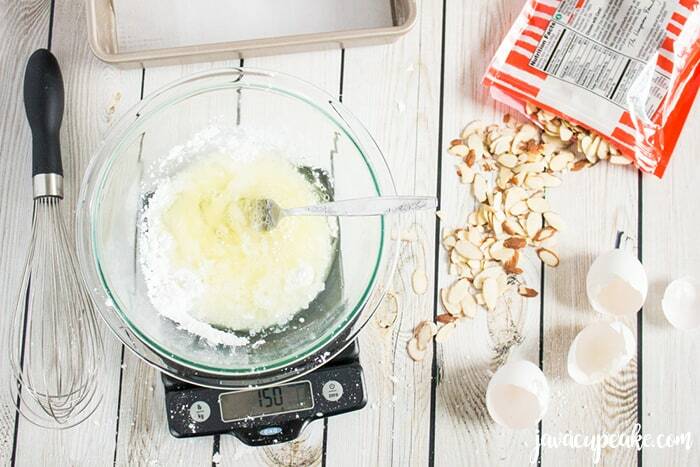 Measure 1660g of batter for each prepared pan. Bake for about 50 minutes or until a tooth pic comes out clean from the center of the cake. 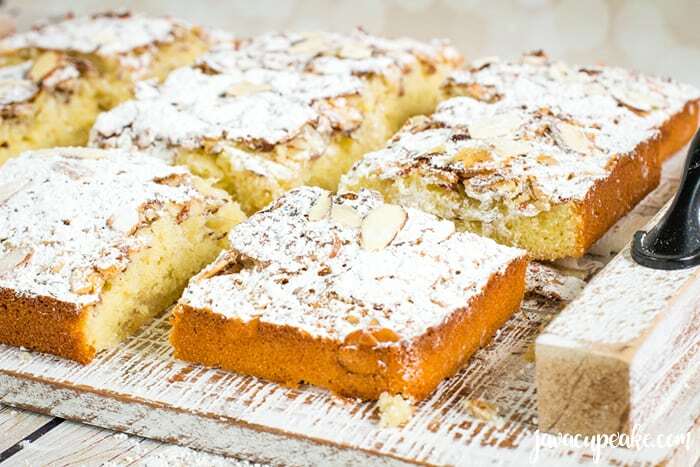 Allow the cakes to cool for 10 minutes until removing to cool completely on a wire rack. Sift the powdered sugar then measure out 5 cups. One cup at a time, add the sugar and slowly mix to combine. Do not mixer longer than it takes to combine. 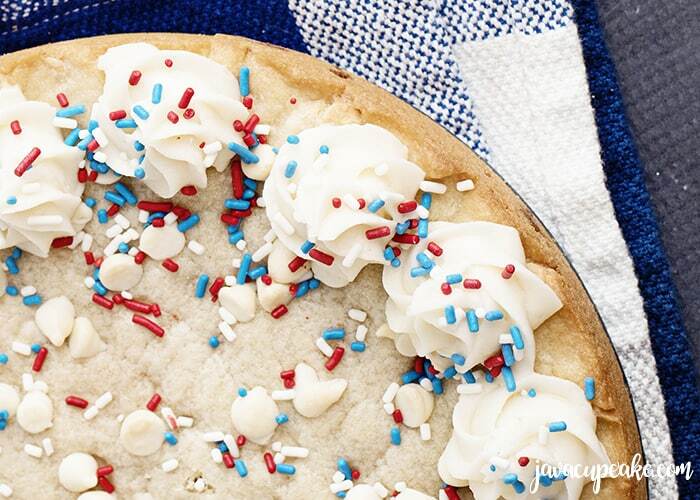 Pour the vanilla evenly over the frosting and mix slowly to combine. Test the consistency of the frosting, if it is too thick add a teaspoon of heavy cream and mix only until incorporated. If the frosting is too soft, chill for 20 minutes before frosting. Trip the hump/top of each cake so they are relatively level. 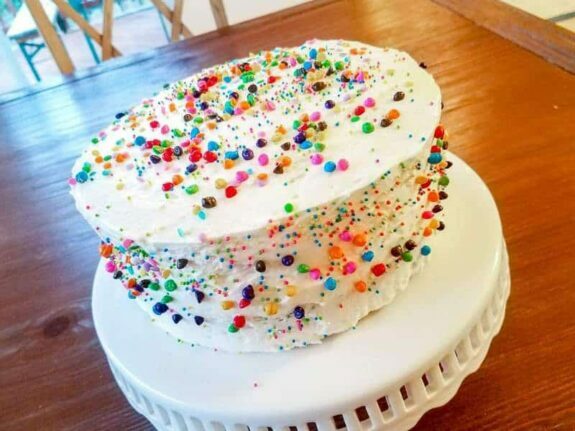 Place the first layer of cake on the cake stand and spread frosting evenly over the top. Add the second layer and repeat. Finish by placing the their layer, cut site down, on top. Frost a very thin crumb coat over the outside of the cake. 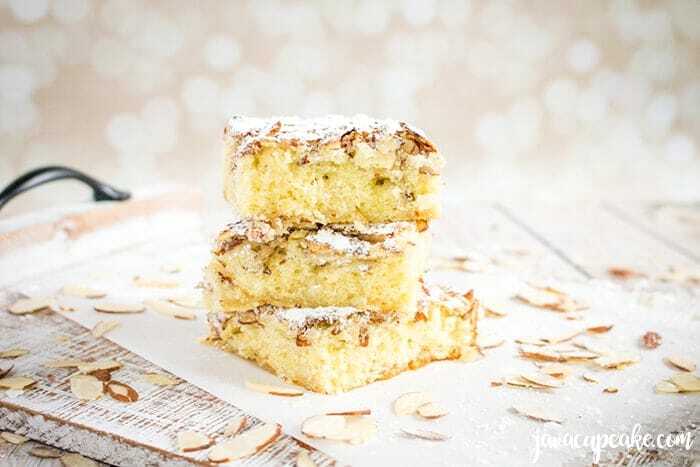 Chill cake for 30 minutes. (Leave frosting in cool place while the cake chills). Once the crumb coat is chilled firm, frost the sides and top of the cake. Using a star tip, pipe swirl dollops of frosting around the outside top edge of the cake. Sprinkle sunflower seeds on each swirl to garnish. Chill until ready to serve. When ready to serve, remove from fridge for 20 minutes before cutting. 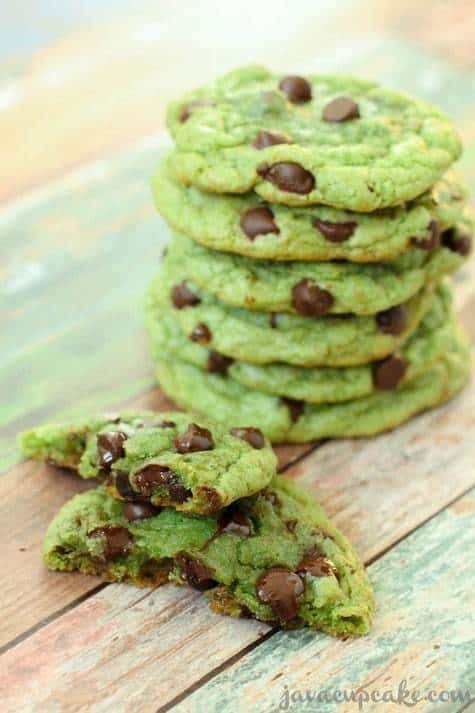 Recipe courtesy of Dog Tag Bakery. 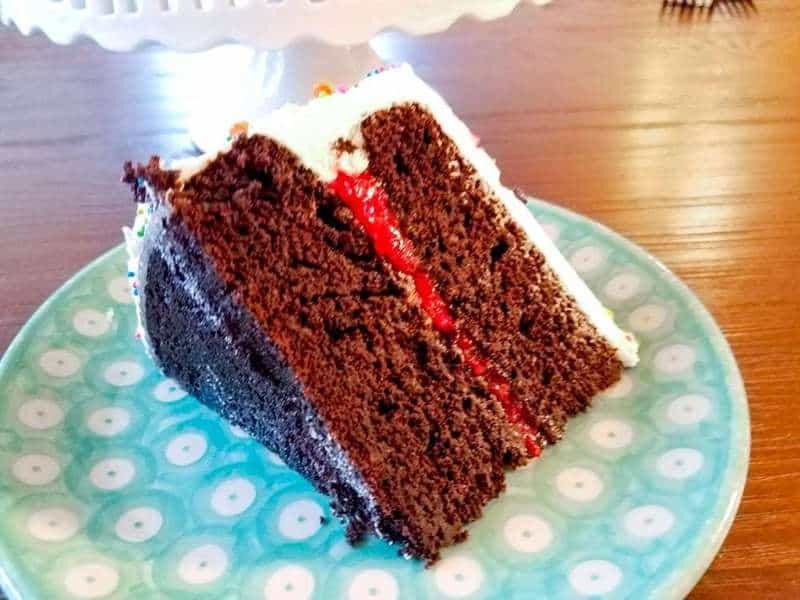 Rich chocolate espresso cake filled with fresh raspberry and topped with whipped vanilla buttercream make this My Favorite Birthday Cake! And I didn’t even have to make it! It’s been at least 15 years since anyone has made me a cake for my birthday. My mom used to make me one every year until I became an adult and then I typically made my birthday cake myself. (Pardon the camera phone pictures… I wasn’t planning on posting this recipe! This year, however, my husband asked if he and the kids could make me a birthday cake and I immediately answered YES. 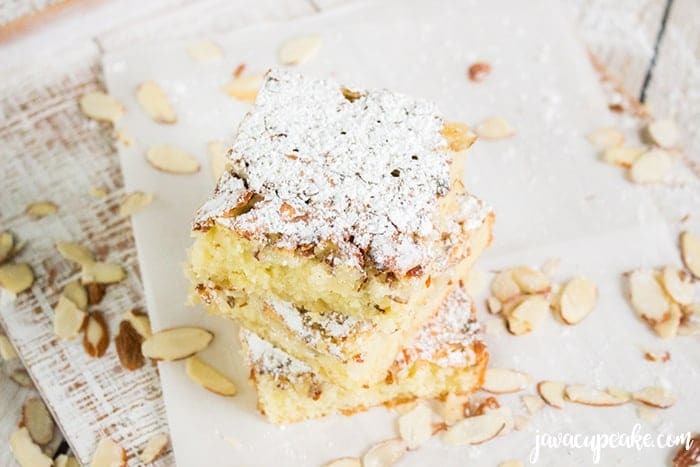 … he had to use my favorite cake recipe from my blog! He said no problem and printed out the recipe from the link I gave him. Dave has watched and helped me so many times over the lat 7-8 years in the kitchen that I knew he had the skills to bake. What I didn’t anticipate was how delicious the cake would turn out. In fact, it was so good that I didn’t share any of the leftovers with my family for the days after my birthday. Nope! That cake was all mine! 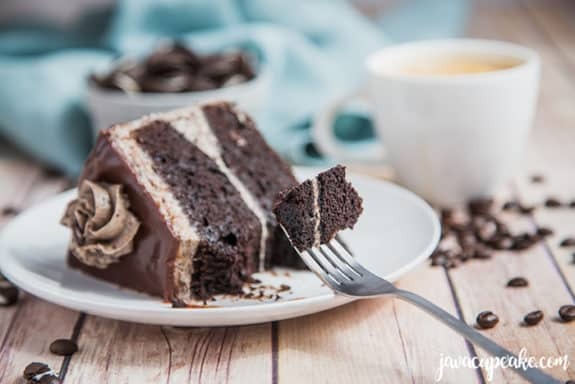 My Favorite Birthday Cake features a dense, rich, chocolate cake flavored with coffee and espresso. Inside the cake is a compote made with fresh raspberries and citrus. I could really eat that compote with a spoon… or on toast… or on ice cream… or off my fingers. On the outside of the cake was a perfectly sweet, whipped, light and fluffy vanilla buttercream. 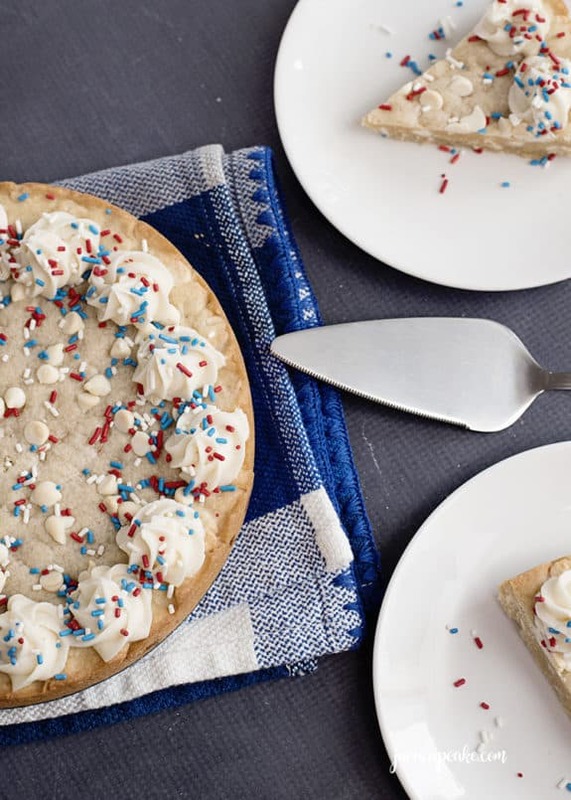 The secret to this buttercream is the heavy whipping cream. 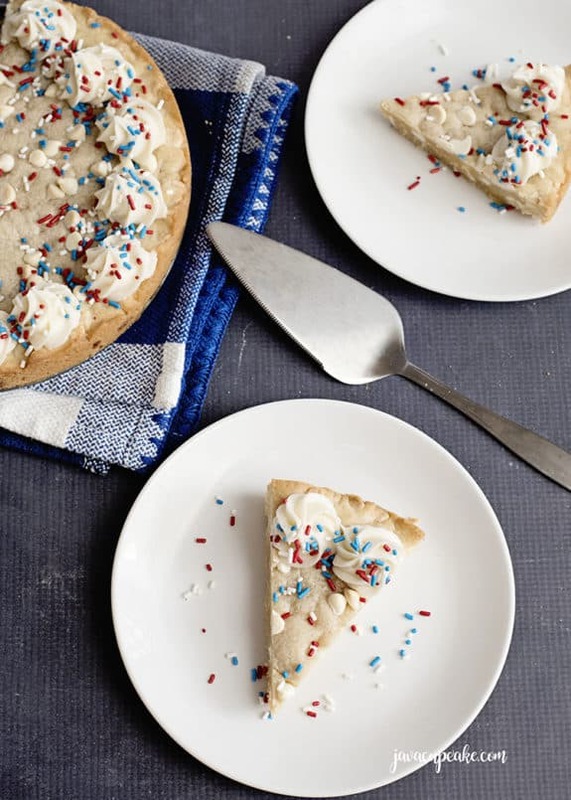 I don’t make any of my frosting without heavy cream… it truly makes all the difference! With that said… I hope you make this cake for yourself some day. It is truly heavenly! Preheat oven to 350 F degrees. Grease and flour 2 8in cake pans. Divide the batter evenly into the prepared pans. Each pan should get half of the batter. Bake 23-25 minutes or until a toothpick comes out clean. Cool in pan for 10 minutes before removing from the pans to cool on a wire rack. Once the cakes have cooled, but are still warm, using a cake leveler to cut off the round mound on the top of the cake. Make sure all four layers are the same size. Add the raspberries, sugar and lime and bring to a simmer over medium-high heat. Stir continuously so that the raspberries begin to break down. Add the corn starch and stir to combine. Continue to cook until the raspberries thicken, about 2 minutes. Remove from heat and allow to cool completely before filling cake. One cup at a time, add the powdered sugar and mix until smooth. Mix in the vanilla extract and pinch of salt. Add enough heavy cream until you reach your desired consistency. You're looking for light and soft but still holds its shape. Mix on high for about 3-5 minute until light and fluffy. 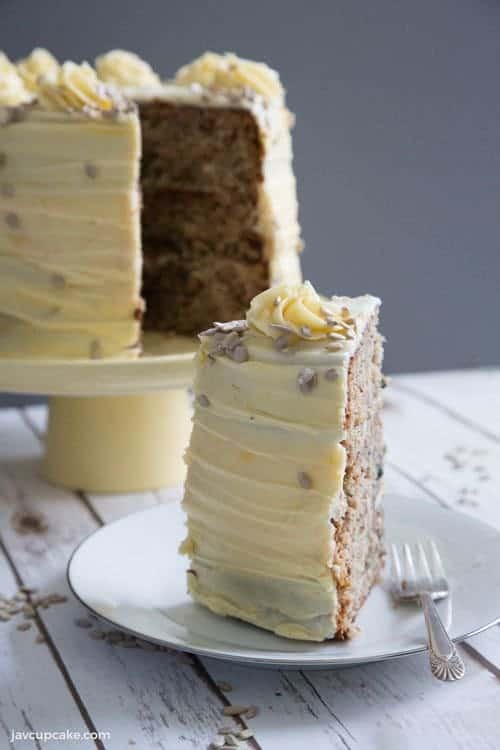 Place one layer of cake on a cake stand/board. Trim the top until it is flat. Pipe a small border of frosting around the outside edge of the cake. Fill the middle with the raspberry mixture. Trip the top of the second cake layer until flat. Gently press it trimmed side down onto the raspberry layer. 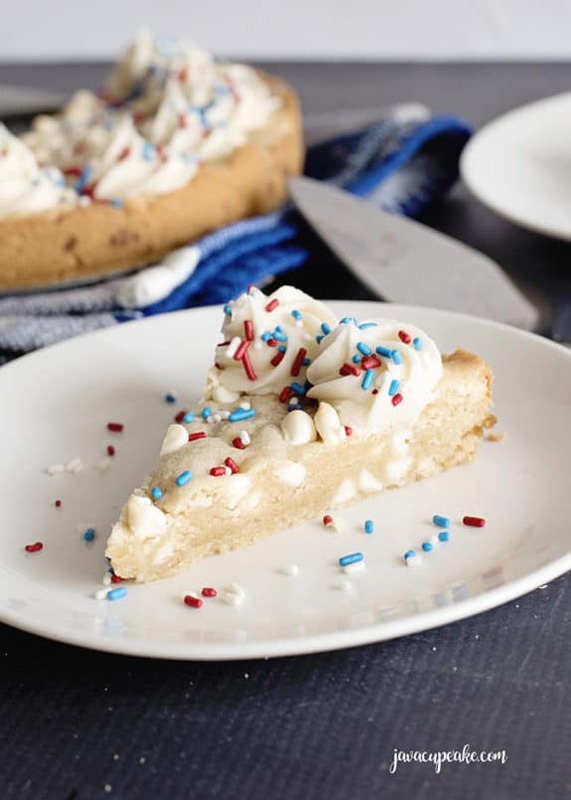 Pipe or spread the remaining frosting onto the outside edge of the cake and smooth out with a spatula.